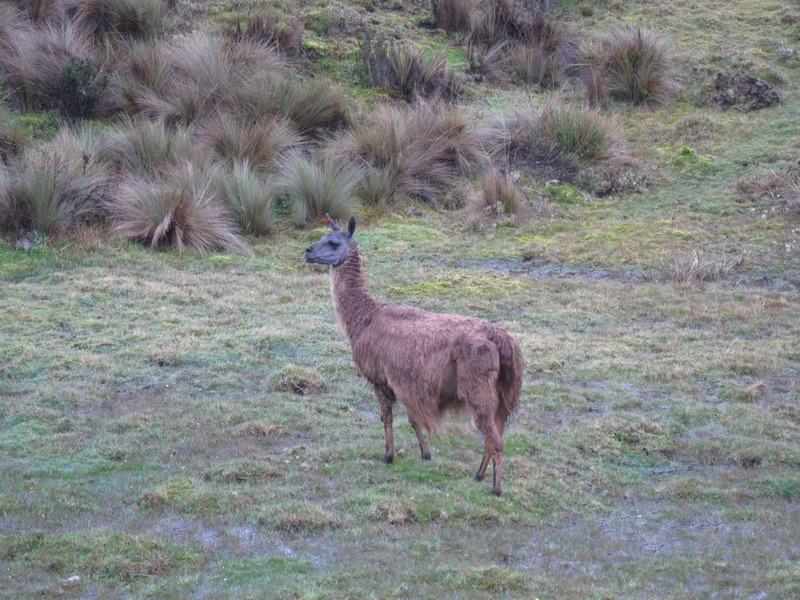 On Sunday, February 13, 2011, we set out for a day trip to Parque Cajas. The park sits about 48 miles northwest of Cuenca. It encompasses over 1,100 square miles and sits mostly at more than 12,000 feet above sea level. It is dotted with 235 lakes and lagunas and is almost always wet and foggy. It feeds the rivers that flow into Cuenca and is run by the city’s water authority. Especially important are small forests of Polylepis trees that are found in sheltered hollows and natural depressions. These trees grow at the highest elevation of any trees in the world. We caught the bus out of Cuenca that goes in the direction of the park and arrived at the there at about 11:30am. After paying our entrance fee and getting a map, we began our hike. The guide suggested a route that would take 3 to 4 hours and would take us out to the road back in the direction of Cuenca where we would be able to catch a bus back to town. The weather was cool, intermittently raining and foggy in areas. There are several warnings to avoid getting caught in the park too late in the day. The fog can get so thick that you can completely lose visibility and not be able to find your way out. Overnight temps can drop below freezing. The trail was marked pretty well, but it was quite muddy and wet. With our limited packing space we weren’t able to take hiking gear so our footwear was less than ideal for this terrain. We had to do a little climbing and several water crossings. It took us 4 hours to complete the hike and by the end our feet and clothes were very wet. But the scenery is very dramatic and lakes are beautiful. Here’s some of our photos. We caught a bus back to Cuenca but it was already standing room only. All things considered, we’re glad we made the trip. That appeared to be an interesting trip. Obviously, you’re very good at direction and compass reading. I’d still be in the fog. The terrain was different, glad the rapids were shallow. Thanks for the posting and pictures. That must take a lot of time. It was pre-spring yesterday and today, 70 degrees. I’m in Murray and took Mother out on the porch at the nursing home. She enjoys my visits, but is more confused each time I come. I need a patience pill , most days. It’s not her fault! She would never choose to be in this condition. I love llamas and alpacas. How cool to see them in the wild. Chinchillas live in the Andes too. I hear that they are a brownish green in the wild. I guess their color helps them blend in with their surroundings. I read an article that claimed the Polylepis tress were like fairytale trees in that they have a feel about them that fairytale creatures will pop out from them. See any strange creatures? I didn’t realize the Chinchillas live in the Andes. We’ll keep an eye out for them. Being inside the Polylepis forest did actually feel like a “fairy tale”. The trees are very dense and everything is wet and dripping. The moss is really thick and covers everything. I didn’t include a photo from within the forest, it just didn’t seem to capture the look, but I’ll send it to you. But, no fairy tale creatures.